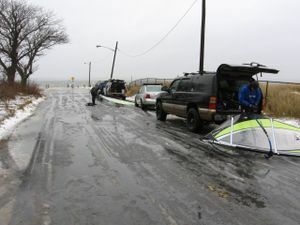 The Peconic Puffin Windsurfing Blog : Do You Like Windsurfing in Freezing Rain and Slush? Do You Like Windsurfing in Freezing Rain and Slush? In the last year I've learned that I can windsurf in crazy cold conditions...if the water isn't frozen over (heck, if only half of it is frozen over,) as long as I'm dressed to the hilt and handling safety issues, I can and will go out if conditions are good enough. Call me crazy...there are plenty crazier, believe me. But today was different. Today I had some doubts about my choice to sail. It wasn't the air temp (44...balmy!...I've sailed in 29 degrees) and it wasn't the water (41 is cold, but I've known 36.) It was the freezing rain and slush. It seemed laughably ugly as I drove up to the South Jamesport beach. "I can not possibly want to do this, can I?" I asked myself. And I was laughing, because I knew the answer. Jon Ford, Scott and the Wolf were huddled in a pickup warming up...they'd already been on the water. Opening a window just a crack to discuss sail size while frozen muck rained down, I asked "I know it's not the coldest day we've sailed, but is it the stupidest?" All laughed. Jon said "Let's sail!" And we did. The crew (Jimmy Sobeck, Jason, Jeff, Jon, John, Scott and I) were on 4.2-4.7's, lit launching on port tack. Port tack launch and NE at South Jamesport is new...usually we'd be at Gardiners Bay or North Sea road for NE, or Ponquogue and the Bowl for E and ENE. But with 60+mph gusts in the morning, big water didn't seem like the call. I sailed for about an hour with my dinged ribs. Got good air early (nothing like jumping into a 40 knot gust...lovely hang time) but as the wind built, them bones started hurting. I wanted to stay out, but figured that one good hour in nuking slush was pretty good. As I drove away, Jason, Jeff and the Wolf went back for more. To answer your original question: no. 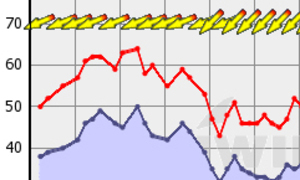 Catapulting Aaron, I tell you this: It's still warmer than skiing (at least the way I skied! Well I think you are **&*& crazy - but that must mean you are feeling better. Good for you, Mac! One thing...all kidding aside. When I go into cold water, I'm wearing a high quality 5/3 wetsuit with heavy boots, gloves, and hood (drysuit on order), I'm sailing with very good windsurfers who are all looking out for each other, and we're sailing locations close to shore where we think we can get out easily in the event of breakdown. We're having a lot of fun, but we're focused on not doing anything stupid. All of that being said, rigging in slush was out there! you're right about the safety considerations and not doing anything stupid. I've always been pretty careful to not get out in conditions beyond my abilities...and always looking out for the fellow sailors, vice versa. I wore a helmet on Sunday too. My thing is that I have trouble wearing gloves. I have cold weather sailing gloves and used them last April in OBX when it was very cold...but it makes me grip the boom more, thus wearing out my forearms. Guess it's still better than not sailing at all. Glad you are observing some safety rules! Still think you're a *&*%&** moron going out in that stuff! My old windsurfing club is located on 69 deg north! And even in the winter we where out sailing on nice days. Sun is back, and it is a really nice day.